From the History Channel, a science film entitled “Proving God”, God is willing to answer the film and Eden documents God’s Answer upon that film in His Revelation contains of 225 pages (folio size). And we will divide it into chapters that in our opinion could summarize that God’s lengthy answer. Thus, please allow us to write God’s Answer in Divine Revelation format serialized in Kompasiana.com. We thank you for your attention. According to Stephen Hawking, “due to the law of gravitation, the universe can create by itself”. However, who creates the law of gravitation? Does he? He just believes that all realities in this world can be explained by scientific theory. Just by this evidence alone, he has denied God. The scientific theorem only exists because there is a law of nature that can be learned by man. The formed formulas and theories are not separated from absolute idealism which idealizes the opinion that human’s mind discovers what is already in the order of the nature. Meanwhile, theories and formulas, as well as regulation and the form of the world of science are formed by the character of the world itself. And it is in accordance with the monistic idealism with its philosophy that the thought is the essence of the nature, and nature is the wholeness of the soul to be made as objective. Whereas, God is an Immanent Logic and Aim or a Creative Soul of the cosmos process. Those all are the essence of absolute monotheism, the Oneness of God that should be believed absolutely without giving any chance to worship upon anyone and anything else. The Holy Book of Eden states to worship absolutely The Only One God and The Almighty as well as The Most Creator for all adherents and all nations and the entire human beings in this world without exclusion. For truly I am The Almighty in creating all things in the entire universes and bestowing lives for all My creation. My recent Revelations provide review about My absolute Oneness. As for the universe, it does not just suddenly exist, let alone from nothing. Even the balls exist not from nothing. Naturalism of the law of nature begins with the creation of the Sun and Black Hole. It conforms the description of the objectivity of the role of the sun as the heliocentric (circumsolar orbit), and Black Hole is as the devourer of universal objects that brings in the apocalypse process and renders the apocalypse of universal objects. All planets, comets and asteroids move circling the sun on their own orbit. There is always a prime function in a creation such as the Sun that becomes the circumsolar orbit for the entire planets, which their gravitations are correlated with the Sun. If the planets always exist on their own orbit, then surely there is a gravitational force that works between the Sun and the planet, as well as gravitational force amongst the planets, so those sky’s objects remain on their own orbit. According to the General Relativity Theory by Einstein, the influence of gravity is not caused by a physical power in a common meaning, rather it is the impact of the curve shape of the outer-space itself. However, Albert Einstein’s theory that states the shape of the outer-space is curve, it is correct since the whole universe exists within the embracement of My Most Global. That is My Shape as I have already explained. How could a man measure the curve of the outer space? How could Einstein come to the conclusion that the shape of the outer-space is curve? He expanded his observation theoretically and explained in a mathematical formulation. However, just one more step Einstein could develop a theory that the embracement of the whole universe is spherical. And that is the real physical shape of God. Thus, My Shape is indeed spherical that embraces all universal objects within the circle of the whole universes. Thus, Einstein’s opinion is correct, when he said that God is impersonal. And God can be reduced not to be akin to human so He can be personalized, since the Reality of God is absolutely not similar with human being. Such also what appears unto human being is not the same in all aspects with God, physical nor character. I am truly The Only One for if I am not, there will be a distortion of mechanism in the system of My Authority toward the universe and all the lives inside. Should there is someone assumes that the universe exists because it really does, the system is inclusive and processed by itself, it is because people with that opinion understand not My Real Shape. As for that suggestion, it is in line with the dream of the scientists to be able to discover a Grand Unified Theory, and considered that it would unravel the secret of God in creating the universe, thus according to them God is not needed anymore. Science without believing in God will be gone astray and paralyzed. Whereas God could be found by using scientific approach as Albert Einstein’s opinion, which is according to him the universe is an expanse of reality that could be understood by utilizing mathematical formulations. He has found God when he said that God is the Creator of the Order with His unwavering Laws. Although actually men with their intelligence are still not able to know the whole laws that regulate the universe, for there is still an aspect of My Most Creation that I apply every time, and wherever and whenever I need. And the principle of My Law I use not only in initiating the creation of the universe or in the initial creation of a man and My other creatures, but rather could still be utilized at the decisive moments of the most recent destiny. It could be called as the modernity of the moment of creation, such as relying on a cutting-edge technology Heaven to conquer men’s arrogance upon their own technology. I shall bring hi-tech Heaven to salvage humankind on this earth who is besieged by the flaring hell due to the process of doomsday on this earth today. And this issue can be denied not when I have found that My Heaven in this world has disseminated such explanation to the public. Thus, I should prove that science and Heaven are in accordance. Creation in the modern age is not proper to be criticized by a science, for in creating the hi-tec Heaven, I even use not the established scientists’ theories that I consider as still shallow. My hi-tec Heaven is precisely useful to bring the atheists to their senses to believe in God. As for Heaven that I promise, it is the spaceship of salvation for the inhabitants of this earth whom I will evacuate to the new earth, that is still pure and comfortable to be inhabited. Those two matters synergize as the blessing of My Heaven. Only My Heaven, in the form of most gigantic outerspace ship that I will bring closer to this earth, which could reach the outer-space exploration, bringing this earth’s inhabitants to be evacuated to the new earth later on. If the ideology of salvation by Heaven that is believed by Eden through elevation by the UFO has not been able to land on this earth and has ever severely humiliated Eden Community, it is due to the perfection of the holiness of Heaven when it would be adjusted in human world, thus it should be questioned unto Eden Community who was ready to be elevated, however the criteria of the most holiness of Heaven has not been fulfilled by them since there was a new adherent of Eden who has not been sanctified as the others. That is a fundamental issue, for Eden’s Miracle could only be revealed if the holiness of Eden Community has passed pure holiness which its quality is equally possessed by them all. The problem is Elfa Diasmara, the new Eden’s follower, that is not realized as the cause of the obstruction to the revealment of Eden’s miracle. It is because not their will that Elfa Diasmara is accepted in Eden, but it is merely My own Will. And Eden Community could never imagine their absolute obedience that has been stated unto Me should be tested with heavy and severely humiliating ordeal. Without this way, how could I prove that they fulfill their promise unto Me? And for Elfa Diasmara, he could also feel Eden Community’s sacrifice upon him. They never question that failure, thus Elfa could be educated to respect other people’s sacrifice for him, before I purify his sincerity to sacrifice for salvaging humankind, which he will bear together with the rest members of Eden Community. In general, Eden Community could soon understand every reason underlies their failure, for they are accustomed to such education. However, Elfa is also educated to be Eden’s member who must equalize his holiness with the other members. This equalization that is borne by Elfa, so he has to face the burning anger of his own family. Heaven is hi-tech indeed, not like bim salabim of the Aladdin lamp. If Heaven I bring down to this world and I begin with hi-tech Heaven, thus could My Heaven save human being who will jostle each other and overcrowding in front of the gate of Heaven without being able to be organized who could come inside the Heaven and who could not? Therefore, I descend down My Heaven to human’s world through a very usual way and counts not as the blessing of Heaven and should go through the twist and turn of blasphemy and tyranny. If by this way, people who approach Heaven are sanctified naturally. Moreover for whom that I choose as the bearer of Heaven, such as Lia Eden. And We could separate the calumniators and the tyrannies of Heaven as the people who will not carried by Heaven. Thus, reflection of the selection of people who could be accepted in Heaven I have made the criteria before the public. My main Heaven later on will impossibly be disdained anymore. And people whom I bring are the best and the holiest people in this world. Therefore, I put forward My Purification upon Eden to be recognized by the public, through whatever testified on Monas incident in the end of May 2015. 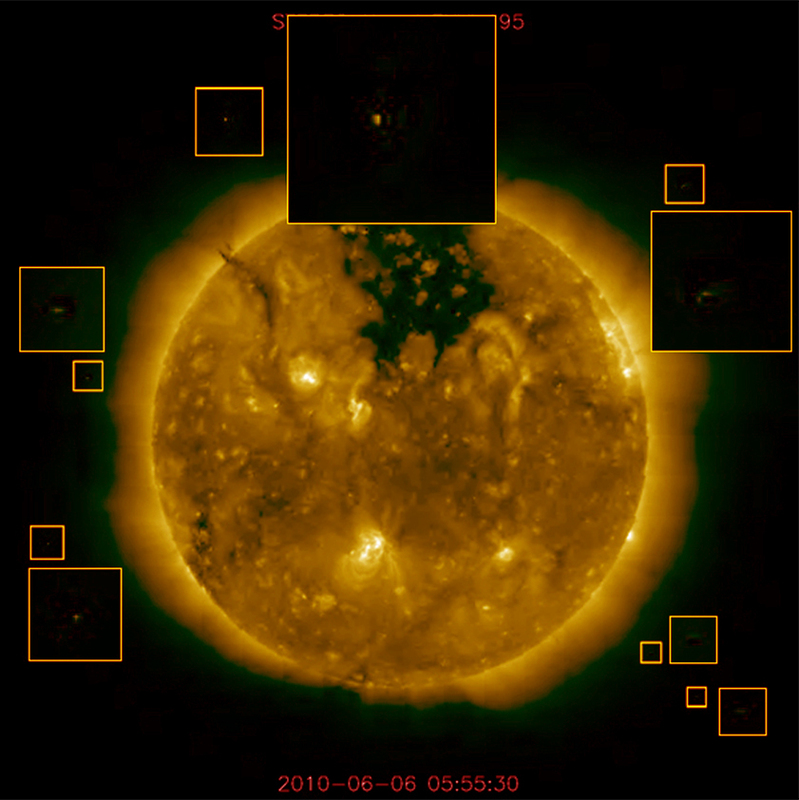 The main spaceship Surga Eden Darussalam has been detected by the astronomers in this world, at least it has been observed by The Telescope Solar Dynamic Observatory (SDO), that there is an existence of a black spherical object close to the Sun has attracted their attention. Indeed, I state that it is My Heaven spaceship, which is as big as the earth, and will evacuate this earth’s inhabitants to the new earth. 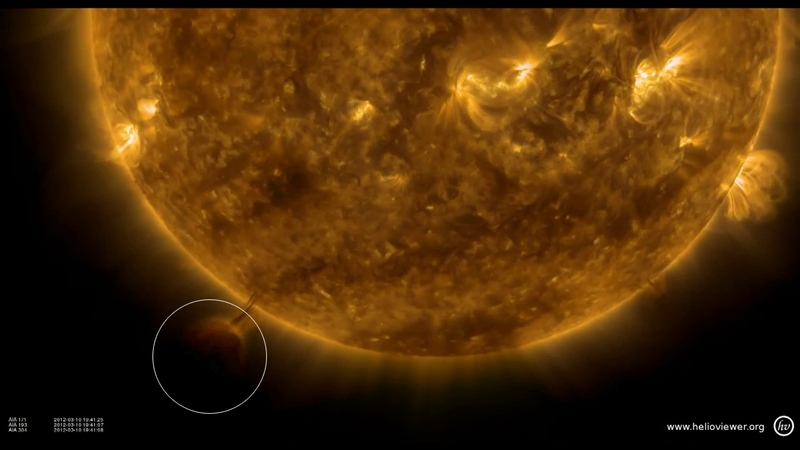 As for the NASA observers, they have detected many UFOs exist around the sun. I need to inform that those are the angels’ UFOs that will be beneficial to bring the inhabitants of this earth, who will be gradually evacuated to the main outer space ship Surga Eden Darussalam that is bigger, before being transported to the new earth later on. Thus, it is My Promise that soon will be carried out. And wait for the coming of the Archangel Jibril who will arrange the setting and organization of My Salvation. However, before that he will first carry out God’s Court of Justice and sanctify the entire countries and nations, and even the whole inhabitants of this earth, thus they are proper to be saved by My Heaven. Surga Eden Darussalam is not bound to the law of conventional physics for as a spaceship with an enormously huge body, Surga Eden Darussalam is provided to evacuate as many as possible the earth’s inhabitants to move to the new earth. Man can predict not how much the weight of My Spaceship is, which is as big as the earth. And why do I create such hi-tech product? If I create not such spaceship, how could I prove The Heaven that I have promised all this time? Even the atheists who believe not in God, they believe not the existence of Heaven. Heaven’s promise is just believed by the believers; therefore I should prove the existence of Heaven. Thus, My Personality could be recognized through My Spaceship that I called as the Main Heaven, and it will divulge the veil of God’s Secret behind the masterpiece of the hi-tec Heaven creation, with its technology that will be utilized to sanctify all nations in the world. Afterwards, there will be no more doubt upon My Existence as God The Only One and The Most Creating. And by this means I shall prove the completion of My Covenant upon Heaven unto all humankinds and the entire religious adherents who believe My Covenant upon Heaven for them. This matter I prioritize to be more specific about the denial upon God by the atheist scientists.